When many people picture a circuit board, they’ll think of a little green square with anywhere from four to 10 layers. While that’s certainly not inaccurate, it doesn’t really account for all the wondrous things that circuit boards can do. Unless you’re somehow involved with PCB fabrication and assembly in some way yourself, you might not even be cognizant of the many ways we’re completely reliant on these little inventions. 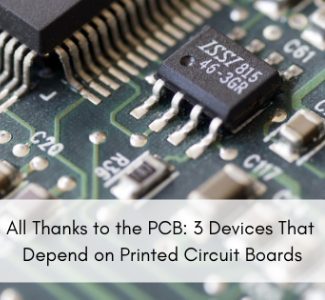 Let’s take a closer look at just three common appliances and devices that depend on the printed circuit boards made by PCB manufacturers all across the country and the world. If you’ve ever used a point-and-shoot or a DSLR, you’ve benefitted from products created during the PCB fabrication and assembly process. The digital camera represents the perfect hybrid of camera optics and modern technology. In terms of the way a digital camera is put together, most models have PCBs as the top and middle layers with mechanical camera components on the bottom. Because the digital camera provides the ability to instantly view captured images on a display screen, it’s typically the main technology professional photographers and amateur shutterbugs will use. While your phone also has a great camera (and PCB! ), these devices are still an essential part of the way we make memories and share images with others. Today, we think nothing of heating up a plate of leftovers or a bag of popcorn in our home’s microwave. But only a few decades ago, the microwave oven was considered cutting edge. Microwaves became readily available for use in the 1950s and 1960s, but they came with a huge price tag. Back then, you’d have to pay thousands (or at least several hundred dollars) to use this technology yourself. Now, of course, these devices are far less of a financial investment. But one thing they do still have is their PCBs. They’re responsible for communicating the intent of the consumer to the technology inside — and subsequently, heat up your food. We may not think of the microwave as the most impressive technological advancement today, but that’s really only because we have come so far in such a short amount of time. The modern consumer wants more convenient options, to be sure. But that consumer also wants to save money and to further the causes they care about. Smart thermostats provide all three, which is why they’ve become so popular in recent years. They allow homeowners to passively save money on utilities while reducing energy consumption and making it easy to keep one’s home comfortable. And compared to traditional thermostats, which involve the turning of a knob, smart thermostats are far more impressive. They’re like little computers that keep track of when to reduce or to increase the heat, depending on how they’ve been programmed. Not only does that take the work out of adjusting the temperature, but it also means that HVAC systems don’t have to work as hard and that consumers can actually reduce their energy use and thereby embrace a greener lifestyle. It’s just one of many smart technologies that we can’t live without. It’s clear to see that PCB fabrication and assembly play an essential role in the appliances and devices we use in everyday life. To learn more about how our custom PCBs can allow your products to become just as necessary, please contact us today.